Indoor plants are beneficial in reducing stress, offering a calming effect, cleaning the air, while outdoor plants displayed in a variety of containers and planters enhance the appearance of a building. 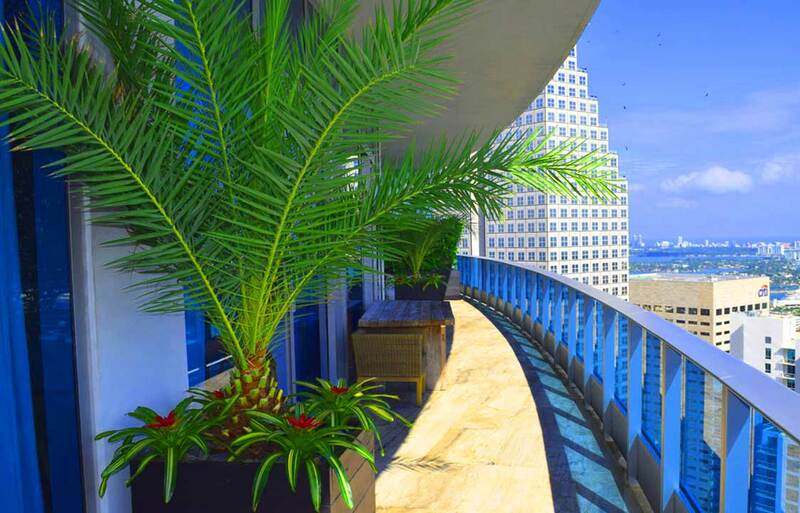 Walkways, front entrances, valet areas, rooftops, pools and patios all directly reflect your image. A tropical, well-maintained area gets noticed and sends a welcoming message to your guests before they even enter your environment. Whether you want to add large palms or trees in outside planters, design a unique patioscape, or plant seasonal flowers along your walkway, Plant Care can expertly assist with all of your exterior plants. We will design a look that perfectly complements your architecture and décor. We also provide expert outdoor plant care to ensure that your plants give and leave a lasting impression. We also inventory a large number of unique planters in a variety of colors and textures that are designed to be used outdoors. Outdoor plants and containers located at the entrance and sometimes extending outward from your main entry offer an aesthetic look of elegance and charm to your building. Our Professionals have years of experience in outdoor plant care and can determine the types of plants that are to be used outdoors. High temperatures, wind, and humidity require plant material that is less effected by variance in weather conditions. We will design a look that compliments your architecture and décor using exterior plants that give and leave a lasting impression.